Stand-in captain Eoin Morgan praised James Taylor's "outstanding" return to the England team, despite his side's six-wicket loss to Sri Lanka on Sunday. 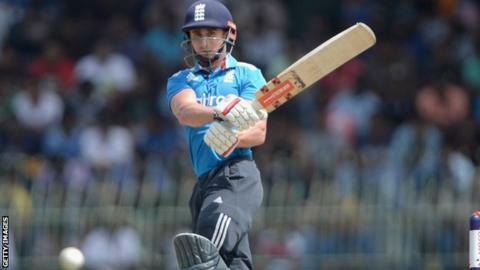 In the fourth of seven one-day internationals, Sri Lanka scored 267-4 in reply after England were bowled out for 265 to move into a 3-1 series lead. Taylor, 24, top scored for the tourists with 90 after not featuring in any of the opening three ODI matches. "James was given an opportunity and he took it with both hands," said Morgan. "He was outstanding. To come in after a really long break and play in the manner he did was brilliant - it was great to see. "Batting at three is quite a big thing, setting up an innings, and he did it magnificently well. He plays his own way, and he didn't lack any confidence." England's defeat means they have lost 14 of the 22 completed one-day internationals they have played in 2014. Nottinghamshire batsman Taylor was playing only his third ODI and his 90, which came off 109 balls and included six fours and two sixes, was his first international half-century in the format. But his dismissal sparked a collapse as England, captained by Morgan as Alastair Cook served a one-game suspension for a slow over-rate offence, fell from 170-3 to 219-7. However, Morgan also found himself in trouble after the game as he was fined 20% of his match fee after his side did not get through their overs in the allotted time. Nevertheless, he had a happier time on the pitch as he got some much-needed runs with a score of 62, after only 19 runs in the first three games, to take the visitors to a competitive target. Sri Lanka responded with fine innings from Kumar Sangakkara (86), Mahela Jayawardene (44) and captain Angelo Mathews (51 not out) as they won with two balls to spare. Spinner James Tredwell was left out as England gave Durham bowler Ben Stokes another chance, but the gamble backfired as his two overs went for 21 and he now has figures of 0-85 from eight overs in the series. "It would've been nice to have had another spinner," said Morgan. "Ben has been in and out of the side and we wanted to give him an opportunity. "To get it down to the last over was outstanding and we are slowly finding our feet. But we will have to play our best cricket to win the last three games." Why are short batsmen so effective?